Anyway, I dug a bit deeper into the OECD figures to have a look at how spending on the various branches of benefit had changed during the period in question. So what did I find? Did unemployment benefit shoot through the roof? 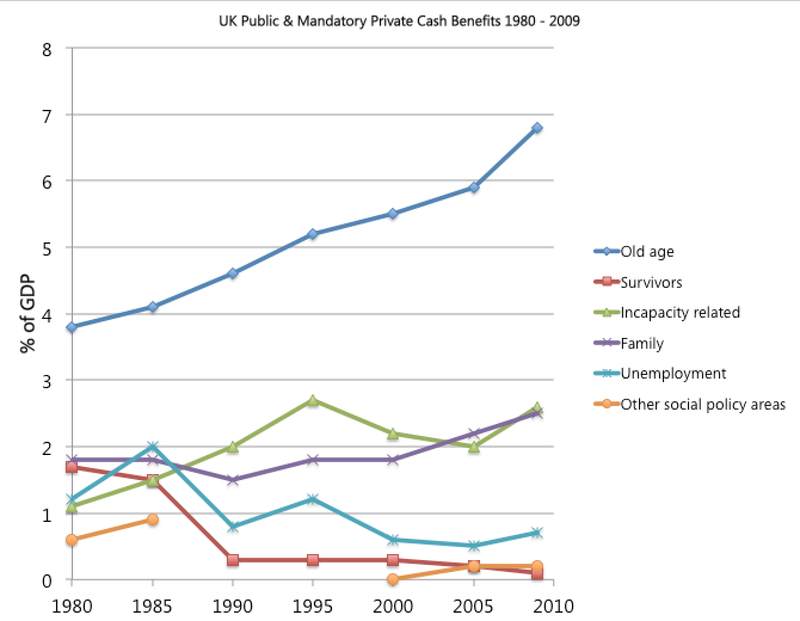 Did incapacity benefit become unsustainable? Nothing here looks remotely scary apart from spending on the elderly and that shouldn’t come as much of a surprise – people are living longer so the number of people who qualify for a old-age benefits is increasing. It’s not hard to understand how this situation happens though. The government wants to reduce spending on benefits but needs to ensure they can spin it into being popular with the public. Convincing the electorate that people on JSA or incapacity benefit are all work-shy scroungers is a lot easier than mounting a campaign against pensioners. The Daily Mail will be with you all the way on the former. Probably not so keen on the latter. By the way – I’m not suggesting they should mount a campaign against pensioners, I am simply pointing out that if the government is as serious as it says about making benefits sustainable, it’s probably the important area to think about. Still, I’m not going to hold my breath. The government’s never going to expend much effort on a responsible debate regarding benefit costs for the elderly. Not while the other people on benefits are such easy targets.